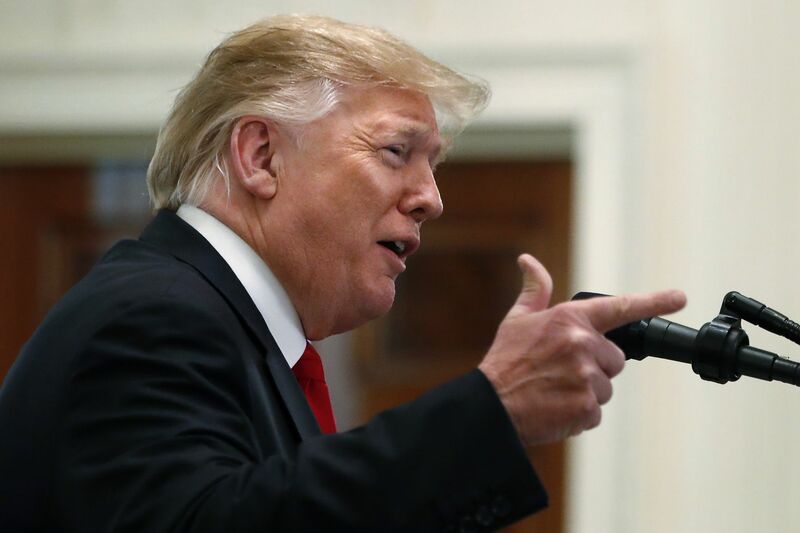 After a gunman left 50 dead in an anti-Muslim massacre at two mosques in New Zealand, President Donald Trump did not condemn the white supremacy extolled by the alleged shooter, nor did he express explicit sympathy with Muslims around the globe. Instead, Trump spent the days that followed on the offensive — averaging just over a tweet per hour through the weekend as he decried subjects from unflattering television coverage to the late Republican Sen. John McCain. One of his few public defenders, acting White House Chief of Staff Mick Mulvaney, took to the airwaves with an unusual declaration that "the president is not a white supremacist." In a broader planning meeting, administration officials briefly considered holding a roundtable featuring persecuted religious minorities — Muslims, as well as Christians and Jews — but the idea was scuttled when the group decided it couldn't pull off such an event on short notice, a White House official said. By Monday morning, Trump still had not heeded the plea of New Zealand Prime Minister Jacinda Ardern — whom he spoke with on the phone Friday — to offer his nation's "sympathy and love for all Muslim communities." But the president had contorted himself into a victim of the tragedy, griping on Twitter: "The Fake News Media is working overtime to blame me for the horrible attack in New Zealand." Trump's tepid response to the New Zealand massacre has highlighted the president's fraught and combative relationship with Islam and Muslims, which dates back at least to his campaign. Throughout his presidential bid and his presidency, Trump has made statements and enacted policies that many Muslim-Americans and others find offensive and upsetting at best — and dangerous and Islamophobic at worst. In a lengthy manifesto, the alleged shooter, a white man from Australia, described Trump as "a symbol of renewed white identity and common purpose" and seemed to echo some of the U.S. president's hard-line rhetoric on immigration, describing immigrants as "invaders within our lands." In response to a reporter's question Friday, Trump said he did not view white nationalism as a rising threat around the world — despite evidence to the contrary. "I don't really," he said. "I think it's a small group of people that have very, very serious problems, I guess." "What I've seen in the right wing — people who haven't been as engaged in the political system until Trump came along, they really are taking his language very seriously," said Mohamed Elibiary, a Texas Republican and Muslim who has served as a homeland security expert for the U.S. government. "He is promoting this nostalgic vision of America. He is always getting us to look backwards." The White House was quick to dismiss any suggestion that Trump should be connected to the massacre or the alleged attacker. In an interview on "Fox & Friends" on Monday morning, Kellyanne Conway, counselor to the president, urged the public and the media to read the entire manifesto, noting that Trump's name is mentioned only "one time." Mulvaney, appearing on CBS's "Face the Nation" on Sunday, also rejected "this idea that every time something bad happens everywhere around the world, folks who don't like Donald Trump seem to blame it on Donald Trump." Yet the president has a long history of disparaging Muslims and other minorities, while simultaneously refusing to forcefully condemn white supremacy and violent nationalism. After a white-supremacist rally in Charlottesville, Virginia, in 2017 left a woman dead, for instance, Trump held a freewheeling news conference in which he said "both sides" were to blame. Trump, after all, fueled his political rise in part with birtherism — the false and racist theory that President Barack Obama was not born in the United States. The rest of his campaign, as well as his presidency, trafficked in language many Muslims found offensive. At a September 2015 town hall in New Hampshire, for instance, Trump pledged to kick out of the United States all Syrian refugees, the majority of whom are Muslim, because they "could be ISIS," a reference to the Islamic State. The following month, in a television interview, Trump said he would "certainly look at" possibly closing mosques in the country. And the next month, Trump toyed with the idea of creating a database of all Muslims in the United States. "Appreciate the congrats for being right on radical Islamic terrorism," he wrote on Twitter, using a controversial term for terrorism perpetrated by Muslims. Once in office, Trump plowed ahead with his inflammatory rhetoric — continuing to use the phrase "radical Islamic terrorism," for instance — and actions. One of his first acts as president was to declare a temporary travel ban on individuals from seven Muslim-majority countries, an executive order that prompted mass confusion and was challenged in court on constitutional grounds. The Supreme Court eventually upheld a revised version of the policy. One former senior administration official said Trump often associated Muslims with terrorism and rehashed grim Muslim terrorist attacks, even in private. "He thinks, and says sometimes, that Muslims are taking over Europe," this person said. This former official and a second person said they'd never heard Trump use a derogatory term for Muslims in private. But they said many of his political calculations are based on how his supporters, whom he often calls "my people" or "the base," will see an issue. The two people spoke on the condition of anonymity to discuss private conversations. Trump's handling of the New Zealand terrorist attack, critics say, also follows a familiar pattern: The president has often seemed eager to highlight attacks and hate crimes perpetrated by Muslims, but he has frequently been slower and less forceful when Muslims are the victims. The thinking behind Trump's comments and silences around the topic of Islam is opaque. Unlike previous presidents, Trump has shuttered much of the official faith-based infrastructure that allowed a wide range of religious leaders to advise the White House on topics ranging from church-state issues to foreign policy. Major U.S. Muslim organizations say that the administration has essentially shut down dialogue and that there is no regular contact between the White House and American Muslim leaders. Oussama Jammal, secretary general of the U.S. Council of Muslim Organizations, an umbrella group of many U.S. Muslim organizations, said Monday that the White House's lack of communication stands out starkly compared with past administrations. Until Trump, he said, the council and many high-profile groups met regularly with the State Department on a range of issues. "He's shutting down the doors," Jammal said. "We tried. We said: 'Regardless of what then-candidate Trump said, or regardless of what he says as president, regardless of our differences, we'd love to meet with him, we'd like to sit down and explain more about Muslim Americans, what we do, how much we have worked with previous administrations. We don't have to like each other, but we have to communicate.' "
Trump's frequently combative stance toward Muslims and Islam, as well as his more muted response to acts of white nationalism, is reflected in the public's view of him. A 2017 Pew Research Center survey found that 68 percent of U.S. Muslims said Trump made them feel "worried." A July 2018 Quinnipiac poll also found that nearly half of voters believed Trump was racist. In the wake of the New Zealand massacre, Trump seemed eager to change the topic. After a tweet Friday expressing his "warmest sympathy and best wishes" for the people of New Zealand — and a brief statement decrying "the monstrous terror attacks" that transformed "sacred places of worship" into "scenes of evil killing" — the president largely devoted his weekend to personal grievance. Mostly alone in the White House on Saturday and Sunday, the president left the compound only for about an hour to attend church and had little on his schedule, according to current and former officials. Trump sent out more than 50 tweets promulgating conspiracy theories about Britain, lambasting a "Saturday Night Live" rerun, criticizing General Motors for its decision to shutter an Ohio auto plant, and attacking the academic credentials and integrity of McCain. Trump also sent three missives supporting Jeanine Pirro, the Fox News host who was suspended after she questioned the patriotism of Rep. Ilhan Omar, D-Minn., because the Muslim lawmaker wears a hijab. In addition, the president called allies "all weekend to vent," said one person who spoke with Trump. A range of frustrations was on his mind, the person said: the 12 Republican senators who voted with Democrats to oppose his national emergency declaration at the southern border, what he viewed as unfair coverage on Fox News, what he has alleged was McCain's role in providing a controversial Russia dossier to the FBI, and the expected timing of the release of a report on Russian interference in the 2016 presidential election by special counsel Robert Mueller. Sen. Lindsey Graham, R-S.C., who spoke to Trump on Sunday afternoon, said the president was largely focused on his recently failed talks with North Korea and his emergency border declaration — particularly Republican reaction to it. The president also complained about McCain and the dossier, Graham said. Overall, Graham concluded, "He was actually in a good spot." The Washington Post’s Michelle Boorstein contributed to this article.